Want to make your own pocket wedding invitations? Here's a step by step tutorial and template to help you do just that! With a little extra effort you can have some unique and elegant handmade wedding invites. OK, I'll be the first to admit that creating your own pocket fold invitations can be quite a lot of work. But it will save you a bit of money, if you play your cards right. The question is, is it worth the amount of money you save in lieu of spending just a bit more for blank pocket folds. My answer? Not really, UNLESS... Well, in my opinion, there are a couple of good reasons to make pocketfold invites yourself. You are the crafty DIY sort of bride who doesn't mind or even welcomes a bit of a crafty challenge (don't worry they are not hard to make, just time consuming). You are only making a small quantity of wedding invitations, say 50 or 80 versus 200 wedding guests. You want pocket folds made from a very specific type of paper or material that are not available pre-made. Unless you have some other sort of personal reason to make these (or maybe you just want to try it out for fun?) I would suggest pouring your energies elsewhere and simply buying some blank pocket invitations. So, for those of you who want to dive in, here's how to make your own pocket wedding invitations using my handy dandy template! 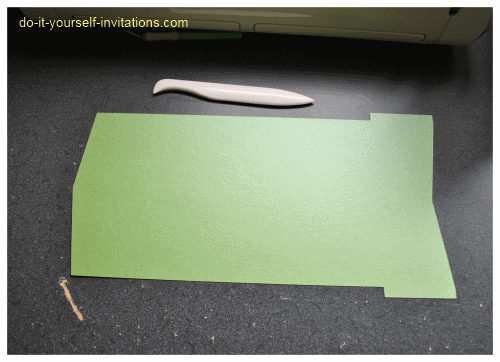 Step One: Using my printable pocketfold invitation templates to create pocket fold invitations. I've created two different templates for this tutorial/project. One is for electronic die cutting machine users and the other is to cut by hand. The pictures illustrated here are of me using my die cutter, just because it is the most efficient way of creating these. 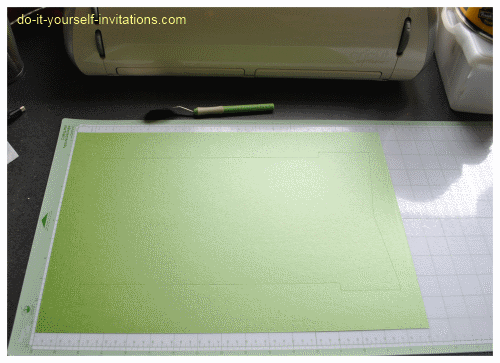 If you are cutting the template by hand - print the PDF template onto some 11 x 17 cardstock. If your printer does not allow you to load 11 x 17" paper you may have to email the template to a local copy shop and have them print it for you. Print just one copy! This will save you money. 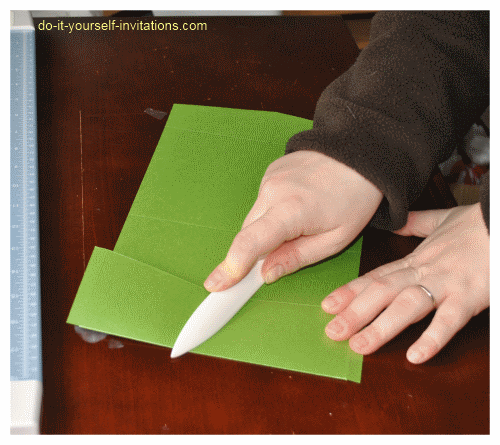 Using a ruler and craft knife cut the paper on the guidelines and use it as a pattern for cutting the rest of your paper into pocket folds. Do this by laying the "pattern" on top of a sheet of cardstock and either trace it lightly with pencil, or simply trace it with your craft knife. For Die Cutting Machine Users - I like to use Sure Cuts A Lot software to use these sort of templates. Sure Cuts A Lot software allows you to "upload" pretty much any shape from your computer to be cut on your machine. Depending on what cutter you are using you may want to consider using it. OK, that being said, download the SVG file and upload it to the SCAL software. Make sure and adjust the template so that it is not lying right on the edge of the mat. 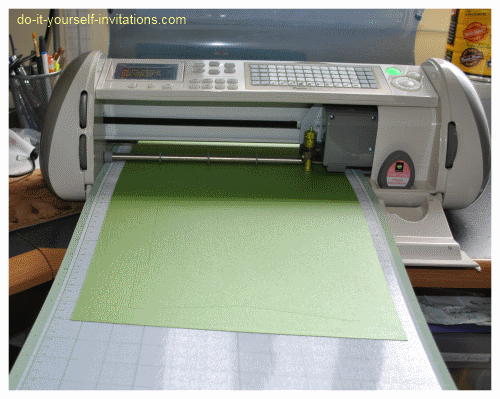 You will also need an extra large cutting mat, and adjust the settings in SCAL so that the software knows you are using a large mat as well. Adjust the machine settings accordingly for the thickness of your paper and the press the "cut" button on your computer. Step Two: After the paper is cut using the template you will want to go ahead and score all of the edges that will need to be folded. I like to use a bone folder and ruler to do this. You can use pretty much anything with a pointed (not sharp) edge, such as the end of a chop stick. Start by scoring the "tabs" that jut out at the far edge where the pocket will lay. These pocket wedding invitations templates are designed to create a 5" by 7" invitation, so you'll want to make the pocket area small enough to fit inside of the invite when folded. Start by scoring across the top of the two pocket tabs at the end. Measure 4 7/8" from where you scored at the tabs, and create another score mark. Measure over again, this time 5 /14" from the last scoreing, and make another mark. 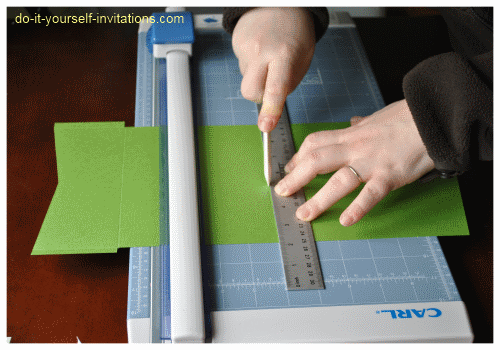 I recommend using a cutting mat or the grid on your paper cutter to make sure you're scoring marks are straight. Some paper cutters even have scoring attachments. I prefer using a bone folder. It makes me feel like I have more control over depth. Step Three: Folding the paper and making the pockets! start by folding over all of the score marks and running your bone folder (or the flat edge of a ruler) across the folds to smooth them out. 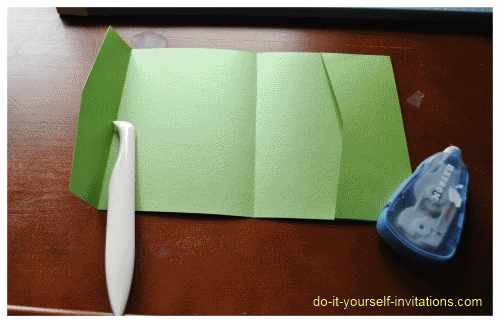 Create the pockets by applying some adhesive to the underside of the pocket tabs, folding them over and pressing the pocket to the inside of the paper. I like to use either permanent adhesive glue runner, double sided tape, or Scotch brand quick dry adhesive. 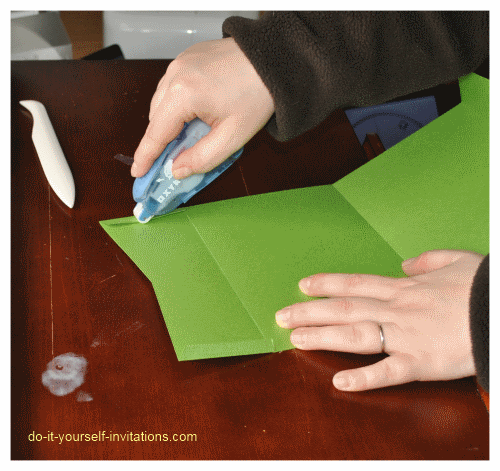 The Scotch quick dry adhesive is the least expensive, but you will need to hold the paper shut for about 30 seconds to a minute to allow the glue to dry. You could also hold it shut with paper clips and remove them later after the glue has dried. 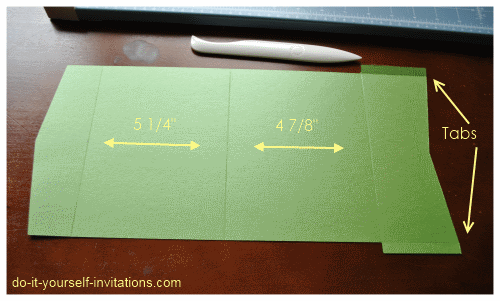 These DIY pockets are great for dressing up a drab printable invitation kit, or even insert one of our printable invitation templates. For the ultimate in inexpensive wedding invitation solutions we also have some free wedding invitation templates to create not only invites but several other wedding stationery pieces. 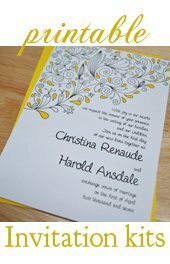 Go to town with rubber stamps or stickers and you could have a fabulous and affordable wedding invitation suite!